There are various ways to analyse time series data such as the annual average global temperature. A common way is to decompose it into its cyclic components using Fourier analysis. This is very useful for long datasets, but not so good for the post-1860 so-called instrumental period of earth temperature readings – there hasn’t been enough time to determine its components. Fourier analysis has its limitations for certain kinds of time series that are technically described as non-linear and non-stationary. About a decade ago a new approach was being developed to analyse time series that, in a way, is a more general technique than Fourier analysis. It’s called Empirical Mode Decomposition (EMD). It can isolate any cyclic components of a time series. In technical terms it decomposes a time series into a finite sum of so-called ‘basis functions’ whose amplitude and frequency are functions of time. It has been used to analyse rainfall, heart rhythms, radar echoes and water waves, to give a few examples. A new paper (Barnhart, B.L., Eichinger, W.E., Empirical Mode Decomposition applied to solar irradiance, global temperature, sunspot number, and.... Journal of Atmospheric and Solar-Terrestrial Physics (2011), doi:10.1016/j.jastp.2011.04.012) uses EMD to look at the earth’s global temperature, the number of sunspots, the total radiation coming from the sun and the carbon dioxide concentration in the Earth’s atmosphere. It produces some surprising results. David Whitehouse: Is It The Sun Wot Done It? If you are not confused about the Sun’s (the star that is not the newspaper as alluded to by the headline) role in influencing the Earth’s climate then perhaps you haven’t been paying attention recently. It is a common story in climate change science. Some researchers will offer definitive statements that the Sun couldn’t possibly be responsible to any significant degree in the recent warm period the Earth has experienced. Look behind such comments however and you will find that the science, as science often is, is more equivocal, as a few recent papers indicate. There is much food for thought. The common view is that the Sun did have a majority influence up until about 1950 – 60, but since then, because of forcing from greenhouse gasses, its role has been miniscule. Miniscule globally that is. Regionally it might be a very different matter. Solar scientists have been going on about this for years. The speculation is that the Sun’s influence could be significant regionally such as across, say, Europe in winter, but not significant globally. However, one does wonder how many local regions are needed to be present before such a solar effect might become more global? The global climate is changing. It always has. Fifteen thousand years ago the place where I am writing this (Hampshire, England) was Arctic tundra on which almost nothing could live. The glaciers reached not far north of here, and places that were to become Manchester, Liverpool and Glasgow were under a kilometer of ice. When the ice receded Britain was completely covered in trees. That the trees are fewer was due to early man. That the ice is no longer here was due to natural climatic cycles. From 1850 to about 1910, the temperature did not change very much at a time when the world was somewhat colder than it is today. Between 1910 and 1940 there was a sustained warming, 0.4 deg C in 30 years. Then there was a period of 40 years when again the temperature did not change much. 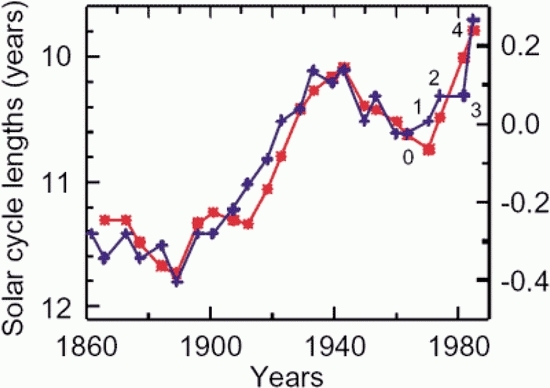 Just before1980 it started rising again, 0.4 deg C in 25 years, but this rise ceased in 2000. We live in the warmest decade for at least 150 years, probably longer, but in the last decade the global average annual temperature has remained at a plateau. In the early 1990’s a paper by Christensen was published that showed a striking correlation between the length of the sun’s sunspot cycle and the global average annual temperature, Fig 1. The shorter the cycle (short cycles are more intense) the higher was the earth’s annual temperature. It seemed to indicate that the sun was the dominant influence on the earth’s temperature variations. It is certainly striking that since the later part of the 19th century and throughout the 20th century there has been a general increase in the Earth’s global average temperature at the same time that the strength of the solar cycle was increasing in intensity as measured by the number of sunspots. In the last half of the 20th century four out of the five most intense solar cycles occurred (the second largest cycle was around 1780) including the strongest ever which was in the 1950’s. Christensen linked these two together in what appeared to be a pleasing way. However, a few years after the work was published others found flaws in the way the final four (out of 24) data points were plotted. In Christensen’s paper the length of the solar cycle decreased between 1950 – 1990 with the last data point showing that the cycle length shortened at the same time that the recent global warming period started (post 1980). When this was corrected the concordance between the solar cycle length and the earth’s rising temperature broke down as it became apparent that the length of the solar cycle showed no trend as the earth’s temperature rose post-1980.